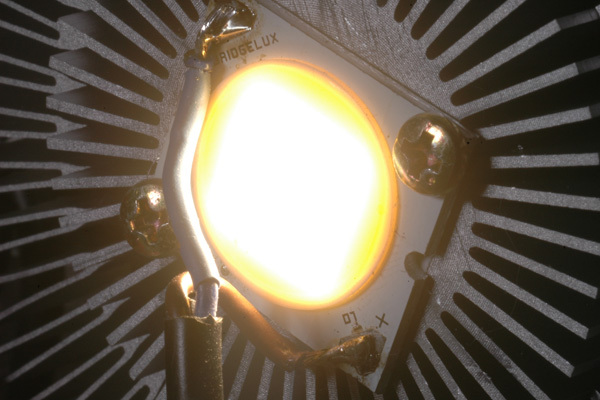 Bridgelux is a family of LED array products. That's the 50W models in the previous post on this project. At less than half the price and a quarter the size of the 50W, this little 26W gem pumps out over a thousand lumens from an area the size of a quarter! 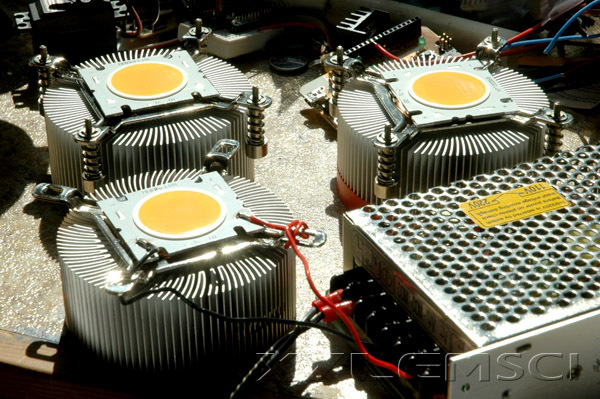 It can be cooled with an efficient 3" diameter heatsink and powered with either a battery or laptop AC/DC Adapter, both of which should be used in conjunction with an LM338K-based Votlage Converter. According to the specsheets, each of these LED arrays should pull 2A and crank out 3500lumens. I haven't hooked them all up yet but I do confirm that the first one I hooked up was super bright. I'm making a trio of power efficient room lighting fixtures. "Arduino is an open source physical computing platform based on a simple microcontroller board, and a development environment for writing software for the board." It's a little circuit board that you can program with your computer to do neat stuff like control lights, motors, actuators and more. I actually built this one myself from a kit. All of those components were lovingly soldered onto the circuit board. - The lamp's body is 6' high and has a 12" diameter. By all appearances it's a long tube of nylon material suspended by a metal ring at the top and weighted with a ring at the bottom. 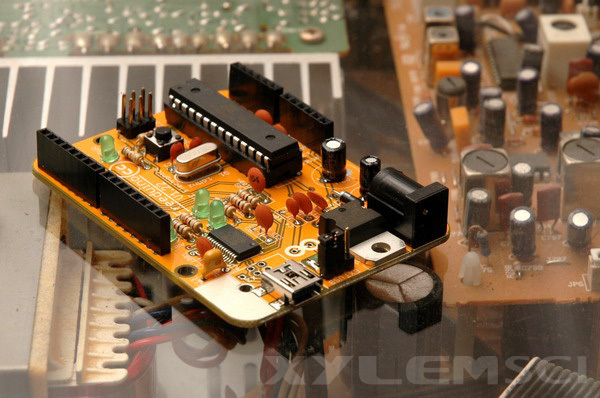 - The circuitry of the lamp will permit it to turn on and off like the famed "clapper". - A carpet switch will trigger the microcontroller to actuate muscle wires to contract segments of the body when someone approaches the lamp.